Below you will find a fraction of what is to be found inside this report. Formula #1: The Ultimate Benefit – FAST & EASY! 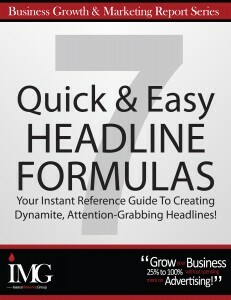 When you’ve taken the time to list all the benefits of your product or service, it’s much easier to begin formulating some excellent headlines. Decide on the most attractive benefit your product offers. What one great advantage does your product give customers? What unique advantage does your product offer? Don’t just guess at it—talk to prospects and customers. Give them a short list of 2 to 5 solid benefits your product delivers on, and then ask them to choose just one. What you hope to achieve with this little exercise, is to get actual prospects and customers to identify the one benefit that is of supreme importance to them . It could be a single benefit or, more likely, the “ultimate benefit” of your product. Try to narrow it down to one powerful benefit and then use that as your starting point. A headline that’s centered around the most appealing benefit has a good chance of attracting far more interest and attention than any non-benefit headline.